A golfing software firm is moving its operations to Belfast’s City Quays development – which is now fully let less than a year after it was built. BRS Golf, the brainchild of Belfast brothers Brian and Rory Smith, is taking the ground floor space in the Belfast Harbour office development. The firm is looking to grow its workforce to almost 100 employees. City Quays already houses firms including law giant Baker & McKenzie and US technology firm Cayan. The building is the first major development on the City Quays site, with a second office building and hotel also under way. 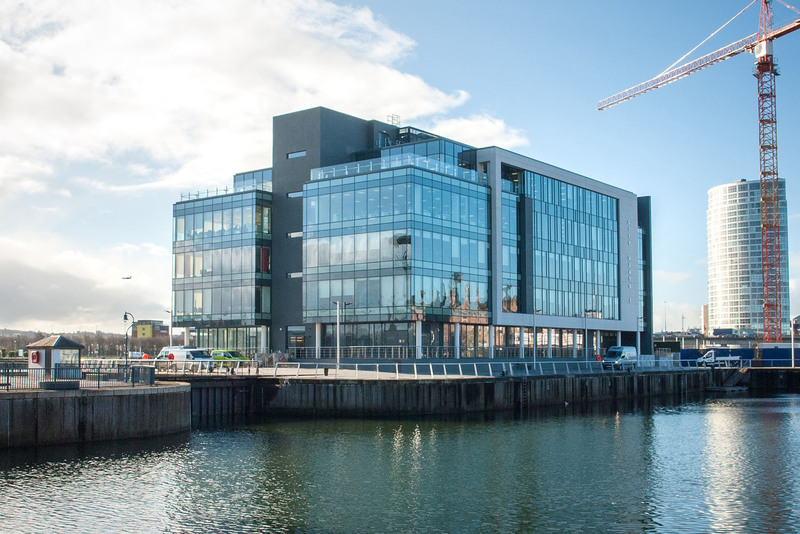 Graeme Johnston, Belfast Harbour’s property director, said: “The fact that City Quays 1 is 100% let within 10 months of its completion is testimony to the quality of office space it offers. Having worked with inward investors and Invest NI, we have tailored the design of the building to ensure it meets the needs of modern global businesses which want to base themselves in Belfast.” He said the sister office development, City Quays 2 – worth £20m – is due to be completed by the middle of next year. “The harbour is already pursuing a number of significant, potential lettings,” Mr Johnston said. Ian Duddy of Colliers International, which acted in the letting, said the City Quays development “provides the ideal property solution for the modern office occupier”. “Belfast Harbour has listened to the occupier market and produced a product that is reflective of what FDI occupiers want”. Meanwhile, one of the biggest hotel brands, the Marriott, is set to take on the new City Quays hotel project with its AC Hotels brand. The hotels are ‘lifestyle’ brands, with each designed to reflect the character of its urban location. It was given the green light during a Belfast City Council planning meeting last month. Planners said the hotel development, which will sit alongside the City Quays 1 and 2 buildings, will “positively contribute to the ongoing regeneration” of the area.